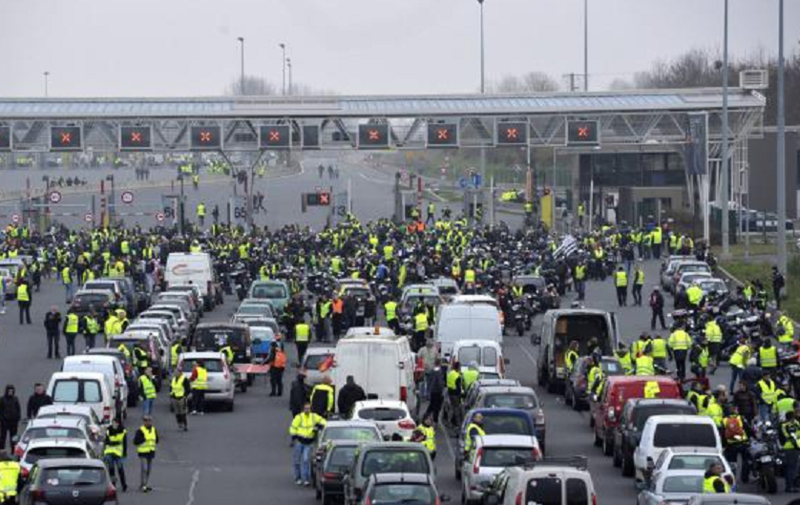 President Macron was nowhere to be seen the whole day while 283,000 protesters all over the country blocked roads and fuel depots protesting the diesel and petrol prices and the new taxes on car ownership the government wants to install as from 1 January 2019. The so-called ‘gilets jaunes’ (yellow jackets) protesters had organized themselves via social media wanting to protest the excessive taxing they feel the citizens have had to undergo ever since President Macron’s party came to power. There were calls of ‘Macron démission’ (Macron resign) to be heard as local media visited protesters. Related coverage: <a href="http://thegoldwater.com/news/42542-France-Car-Drives-Into-Fuel-Price-Protesters-1-Dead-Video"> France – Car Drives Into Fuel Price Protesters, 1 Dead (Video)</a>. The actions were not without incidents though. One protester died in the Savoie region when a woman wanted to bring her daughter to the hospital and panicked when she could not go any further (see related coverage). In other places all over the country more than 227 people were injured, of whom at least six were left with serious fractures. Police arrested 117 people for rebellion or because they tried to break through demonstrator blockades. 75 were kept in custody. At a demonstration in Strasbourg, a motorcyclist from the French police was injured when he was hit. The victim suffered several fractures and is currently in the hospital. At the Elysée in Paris, the residence of French president Macron, a tense atmosphere prevailed last night. Campaigners demanded the dismissal of Macron’s government. Security forces fired tear gas to expel hundreds of protesters. "Approximately 1,200 people have gathered, and the neighborhood has been closed," the French Ministry of the Interior reported at 6 pm yesterday evening. According to the angry protesters, the government is responsible for the rise in fuel prices through the introduction of a special green tax. The government claims that is only partly the cause and the prices on the oil market cause the largest part of the increase. Prime Minister Édouard Philippe has called the actions unacceptable. Imagine if the French would get together like that and run the muslim/afro glommers out?? The 283000 protesters figure is the official count by the Ministry of Interior. In reality, it is at last five time more. Roughly more than a million protesters. People protest against the huge tax rise of early 2018. In France, the price of fuel is composed of 60% taxes. The government pretended to tax more diesel than unleaded gasoline although people were told during decades it was more environment friendly. You let in a Million plus free-loaders (Economic Refugees) and the Taxes have to go up to support a collection of people seeking the EASY LIFE. Macron the Moron is still pushing globalism and agenda 21. The French don't want what the Rothschilds want! Anon 42638… Nice to see that some people at least have a clue about what is happening. Unfortunately, it's not just the Rothschild family. It's the Astor, Windsor, Rockefellers and the other 9 richest families, in the world, that lead the Luciferian Illuminati and they use Free Masons/Sisters of the Eastern Star to infiltrate EVERY institution, at every level, in every country around the world.